February 5, 2018 Brittany G.
A seemingly innocent question, but for those new to cycling it can seem a bit overwhelming. Especially when a lot of shops will either have an entire wall dedicated to helmets OR stacks upon stacks of them filling up any free space you can find. So where to begin…. 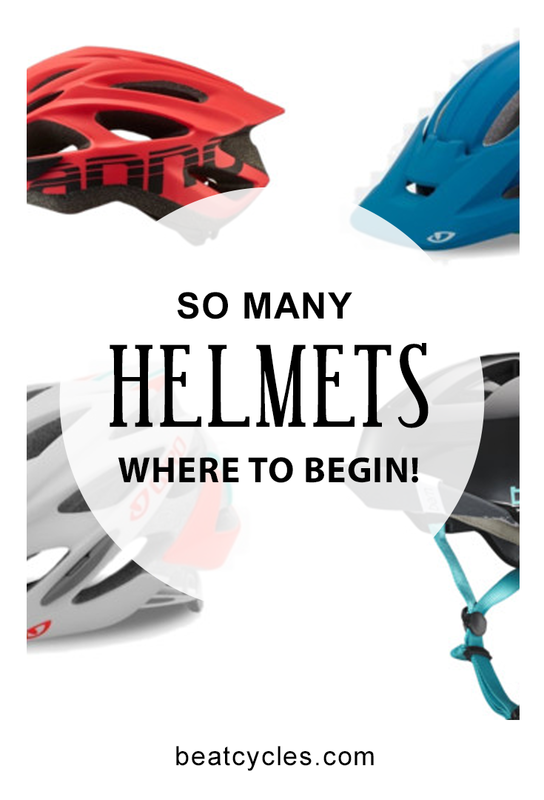 First off, as far as safety goes, all helmets must meet the same general requirements. Which means technically speaking, a $40 helmet will meet the same safety requirements as that $200 helmet. So why would you even consider forking out the extra cash? Great question! While all helmets must meet the same basic safety standards, not all helmets are indeed created equally. A few main differences you will notice are the weight, fit, and ventilation of a helmet. The more money you are willing to spend, the lighter the helmet will (typically) be, the better it will fit/the more comfortable it will be, and the more ventilation you will get. QUICK TEST! A great way to visualize the difference in ventilation between helmet models is to make a fist and place the helmet on top. The more space you see between the top of your hand and the helmet, the more ventilation you get. ALSO, a lot of base models will cut the plastic on top to make it appear as though the ventilation is better than it actually is. My general feeling with trying helmets on is that the more comfortable it is, the more likely I will be to wear it. I feel like the #1 reason people avoid them is because they are hot and uncomfortable. NOW THAT WE HAVE THE BASICS OF HELMETS OUT OF THE WAY, LET’S TALK STYLES! Recreation helmets are just that. They are your basic, all around, helmet that will come in an assortment of colors, usually have a removable visor, and typically begin around $40 or so and go up from there. Mountain helmets tend to be a little boxier, have much better ventilation than the recreational helmets, and come down farther on the sides and in the back. While designed with the mountain biker in mind, these are still a great option for the everyday cyclist and a favorite among a lot of commuters. There a few key factors you can almost always expect from road helmets. They are light, sleek (arrow dynamic), and usually won’t have a visor. If an incredibly light and breezy feeling helmet is top of your list for important features, a road helmet is the way to go. Commuter helmets tend to be a little more rounded, have less ventilation, and focus more on style. A lot of people reference them as looking more like “skater” helmets.You will also find that a lot of these helmets will come ready to swap out the interior as the the seasons change (i.e. a “winter kit” that will protect your ears when the temperature drops). While there are other styles out there (full face, aero, etc.) these are what you are most likely to find in your local bike shop. Hopefully this makes that initial question a little less daunting! What’s you’r preferred helmet style? Comment below!